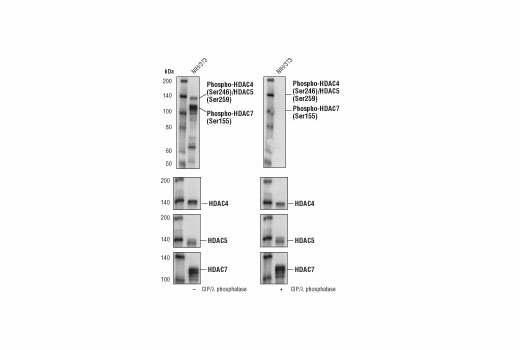 Phospho-HDAC4 (Ser246)/HDAC5 (Ser259)/HDAC7 (Ser155) (D27B5) Rabbit mAb detects endogenous levels of HDAC4, HDAC5 and HDAC7 proteins only when phosphorylated on Ser246, Ser259 and Ser155, respectively. Monoclonal antibody is produced by immunizing animals with a synthetic phosphopeptide corresponding to Ser155 of human HDAC7 protein. Histone deacetylases (HDACs) interact with an increasing number of transcription factors, including myocyte enhancer factor 2 (MEF2), to negatively regulate gene expression. HDACs are regulated in part by shuttling between the nucleus and cytoplasm, where export to the cytoplasm facilitates gene activation by removing HDACs from their target genes (8,9). The cytoplasmic export is facilitated by 14-3-3 proteins, which bind to specific phospho-serine residues on the HDAC proteins (8,9). These phospho-serine 14-3-3 binding modules are highly conserved between HDAC proteins, allowing for their collective regulation in response to specific cell stimuli. For example, the highly conserved HDAC 4 Ser246, HDAC 5 Ser259 and HDAC 7 Ser155 residues are all phosphorylated by CAMK and PKD kinases in response to multiple cell stimuli, including VEGF-induced angiogenesis in endothelial cells, B cell and T cell activation, and differentiation of myoblasts into muscle fiber (10-14). Grozinger, C.M. and Schreiber, S.L. (2000) Proc Natl Acad Sci USA 97, 7835-40. Wang, A.H. et al. (2000) Mol Cell Biol 20, 6904-12. Wang, S. et al. (2008) Proc Natl Acad Sci USA 105, 7738-43. Matthews, S.A. et al. (2006) Mol Cell Biol 26, 1569-77. Parra, M. et al. (2005) J Biol Chem 280, 13762-70. McKinsey, T.A. et al. (2000) Nature 408, 106-11.